First Line: The northeastern Aegean island of Lesvos, a place of quiet beauty, storied history, and sacred shrines, had long drawn the attention of tourists, though never quite the hordes of off-islanders that descended each summer onto some of its much smaller, but far more notorious, Cycladic neighbors to the southwest. The Greek island of Lesvos has been an agrarian paradise for centuries. Covered with wildflowers, a favorite stop for migrating birds, it's now known for human immigrants fleeing from war and terrorism. Mihalis Volandes is one of the island's most privileged citizens, and he's developed a plan he wants to put into action, a plan that will strike at the heart of the lucrative human trafficking trade. When he's found outside the door to his estate, cleaved in two with a sword, the island is in an uproar-- especially when it looks as though a refugee is his killer. Within hours, the phone rings in the Athens office of Chief Inspector Andreas Kaldis. American Dana McLaughlin, the head of SafePassage a non-government organization on Lesvos to aid refugees, is convinced Ali Sera is being framed, and she doesn't trust anyone in the local government to see justice done. In no time at all, Kaldis has his team on the move, finding the facts they need in order to catch a dangerous killer. 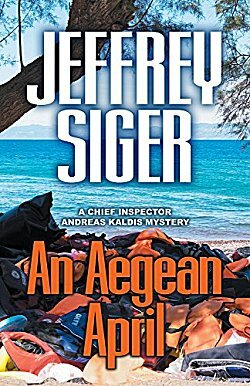 Jeffrey Siger can always be trusted to bring the country, the history, and the customs of Greece to life and this ninth book in his Chief Inspector Kaldis series is no exception. Kaldis and his team, along with their wives, girlfriends, and children are a true family whose bonds are every bit as strong as blood. These people have worked together for a long time, and they've learned how to work smart and take few chances with their lives. Since I'm attached to this entire group, I like seeing them use intelligence instead of brute force to get the job done. In An Aegean April, readers get an up-close-and-personal look at the refugee crisis and the resulting plague of human traffickers that has grown up around it. There is money to be made from thousands upon thousands of desperate people, especially since the governments involved would rather look the other way than do something that would actually alleviate the situation. There is even more money to be had if leaky boats are used and defective equipment sold to what "others in the smuggling trade call...fish or cement blocks." To this sickening situation, Kaldis and his team bring their talents and their determined focus, aided by two strong (and sometimes misguided) women, one American and one Greek. We also meet another character who's been seen in a previous book, and as soon as I saw that person, I knew it wasn't a one-scene-only appearance. I was right. This character appears at the end in a sort of deus ex machina, and although I might pick this apart in almost any other book, I have to smile. If you're going to use the deus ex machina device, it has to be in a book set in Greece, and Siger's books are so Greek, the pollen from the olive trees makes me sneeze. If you haven't read a Chief Inspector Kaldis novel before, I suggest you begin at the beginning (Murder in Mykonos) so you can see how this group of people come together and become a family. This is one of my favorite series, and I hope it will become one of yours, too. I'm glad you enjoyed this as much as you did, Cathy. I really do like the way Siger evokes the setting. And you've reminded me that I still haven't done a spotlight on his work. I need to do that!